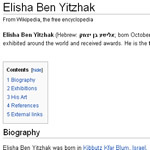 Elisha Ben Yitzhak was born in Kibbutz Kfar Blum, Israel. His parents immigrated to Israel in 1936 after being in a Zionist movement. Being raised in the Kibbutz, Ben Yitzhak worked in the farm in his childhood. He served as a paratrooper in the Israeli army. Ben Yitzhak started painting after seeing a close friend getting killed by a hand-grenade in training accident in 1963. In 1966, he started to study under the guidance of master artists in the Bezalel Academy of Art and Design in Jerusalem, and 2 years later he studied art at the Avni Institute of Art and Design in Tel Aviv. Click Here to read the entire Wikipedia article.